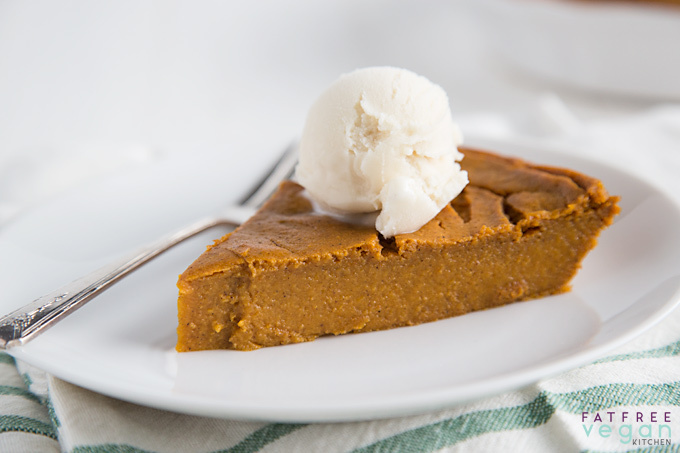 This gluten-free, vegan pumpkin pie forms its own crust as it bakes. Delicious and addictive–and low-fat and only 153 calories per serving! I asked my readers yesterday to identify a close-up photo of a food. The mystery food wasn’t a mystery to most of you: it was indeed a Pumpkin or Squash Pie. 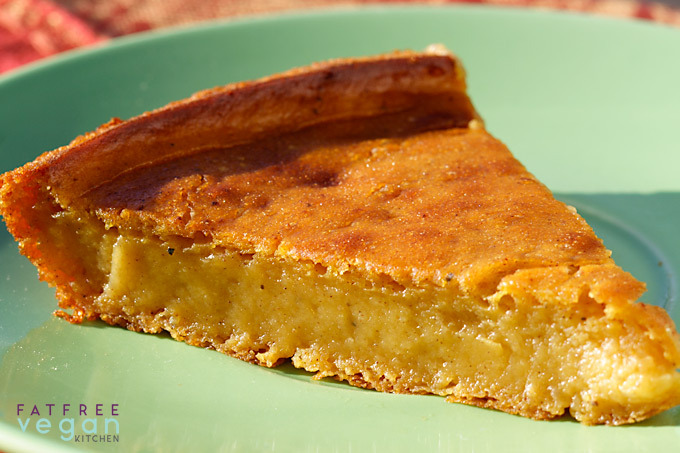 But, if I were the kind of teacher who demands exact answers (and I used to be), you would have had to have written “Impossible Fat-Free Gluten-Free Vegan Cushaw Pie” in order to get full credit. Cushaw? What the heck is that? Well, do you remember these cute squashes? 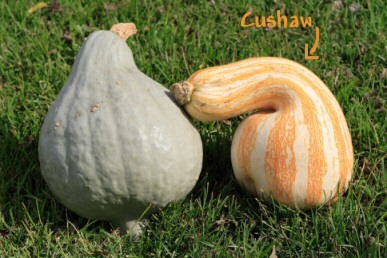 I did a little research into cushaw squash and found that much of the pumpkin that we buy in cans is actually cushaw and its close relatives; it’s less stringy than pumpkin and makes better pies. So I feel like it’s okay to call this a pumpkin pie even though it originated from a crazy little crookneck squash called a cushaw. So that’s the “cushaw” part of the name. What about the “impossible” part? If you grew up with a mother who relied on Bisquick baking mix, as I did, you may remember their Impossible pies. What you did was mix Bisquick in with the pie ingredients, and as the pie baked, a sort of crust formed on the bottom and sides. I’m not too embarrassed to say that the first cheesecake I ever made was the Bisquick Impossible Cheesecake–and it was really good. 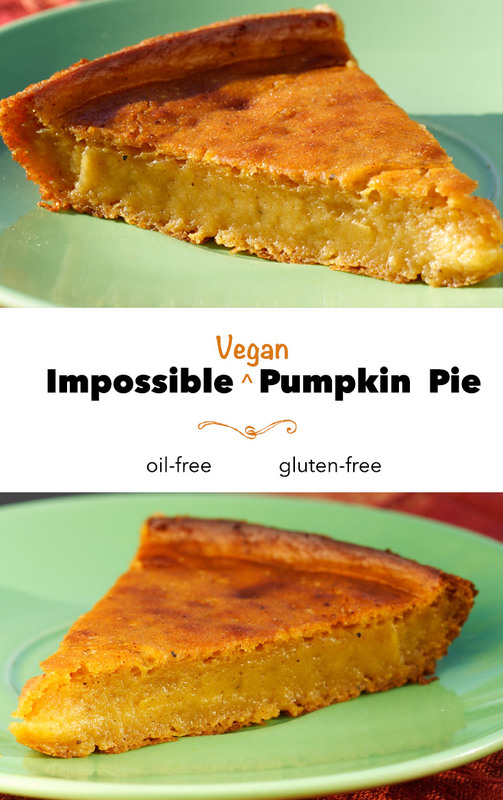 Flash forward to the present when I’m looking to get rid of the most fattening part of the pie–the crust–and the idea of a vegan Impossible pumpkin pie hit me. So I went straight to my favorite cookbook–Google–and started looking for info on Impossible pies. I no longer use Bisquick, so I wanted to see if people had made this work with flour, and I was happy to find that they had. In fact, Something in Season and Bob’s Red Mill both had gluten-free versions of the pie, so I knew it could be done without Bisquick. What remained to be seen was whether or not it could be done without oil or dairy products. I did a whole lot of substituting, but I’m happy to report that the pie was a success: Though the inside is more like a custard than a regular pumpkin pie, a slight crust formed along the bottom and sides of the pan, so you can actually pick up a slice of this pie and eat it like a piece of pizza. But it’s dangerously addictive, as shown by the fact that my husband ate about 6 pieces of it yesterday! Update 7/30/18: My husband asked for pumpkin pie for his birthday–in the middle of summer! 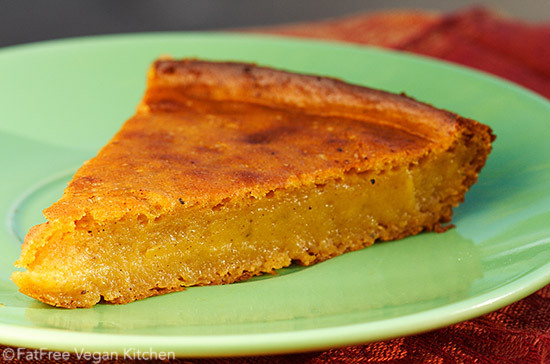 With no winter squash available, I made this pie with canned pumpkin, and it was a complete success. I didn’t need to make any changes to the recipe. So if you don’t have any winter squash available, do not hesitate to make this recipe with canned pumpkin. It’s great! Preheat oven to 350 F. Spray a 9-inch deep dish pie pan with cooking spray. (I used a Pyrex pan, and it came out with no sticking.) A deep dish is recommended because this pie will rise a lot during cooking but will fall back down as it cools. Remove from the oven and allow to cool on the counter. For best results, refrigerate until chilled before eating. *If you don’t have Ener-G egg replacer, you can omit it and the 1/4 cup water and use any other replacement for two eggs. **The pie will come out best if the pumpkin is very dry, so after my pumpkin is mashed, I drain all the water off completely by putting it into a cheesecloth-lined colander and letting it drip over a bowl. 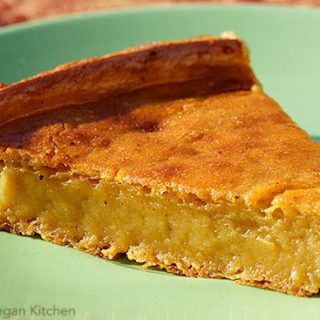 ***I have made this pie with white rice flour and with whole wheat, and the rice flour pie was infinitely better than the ww, which was gluey. If you use another type of flour, do so at your own risk. Check the comments to see what has worked for other people. Can this pie be prepared ahead of time and frozen? Thanks for the information. I’ve never done that, so I don’t know if that would affect the texture. I made this today, and it was delicious and easy. I happened to have brown rice flour on hand, yay,! I did use flax eggs because I don’t have the En-R G and that stuff’s a little expensive, but it turned out really well. I love the pudding-y texture with a little crusty edge. The omnivore man who ate it with me was quite impressed, too. I’ve made a couple things from this blog and want to thank you for great recipes. I’m excited to try this. Has anyone tried it with lite coconut milk? I know this recipe has been on your blog for some time, but I made it today as a Thanksgiving test run, and this is perhaps the best dessert I’ve ever eaten. My daughter was scraping the batter from the Vitamix and licking the spatula, and asked how she could remove the Vitamix blade so she could eat more batter. Really, really amazing recipe. I was at the store to buy brown rice flour. There was a superfine ground brown rice flour and a whole grain stone ground brown rice flour. Would the superfine expensive flour work better for this recipe or not? At the store they had a superfine brown rice flour(expensive) and a cheaper whole grain stone ground brown rice flour. Would the superfine work better for this recipe. I bought the cheaper version and will use it to make the recipe. Just wondering. I think I use superfine. I’m away from home now and can’t check the bag. I don’t think it makes a huge difference. An excellent pie. When I ran out of brown rice flour for the third one, I used buckwheat flour. It is dark, but has an amazing flour. Thank you for maintaining such a great site! I made this pie again this weekend for a friends birthday. Everyone loved it!! I am soooo glad I found this recipe a few years ago! I mostly use coconut milk (not that canned fatty one, but the ‘milk alternative in a package’kind) or oatmilk and that works perfect as well. As I am a student I am sometimes wondering if I could replace the brown rice flour with oat flour, since that is cheaper. 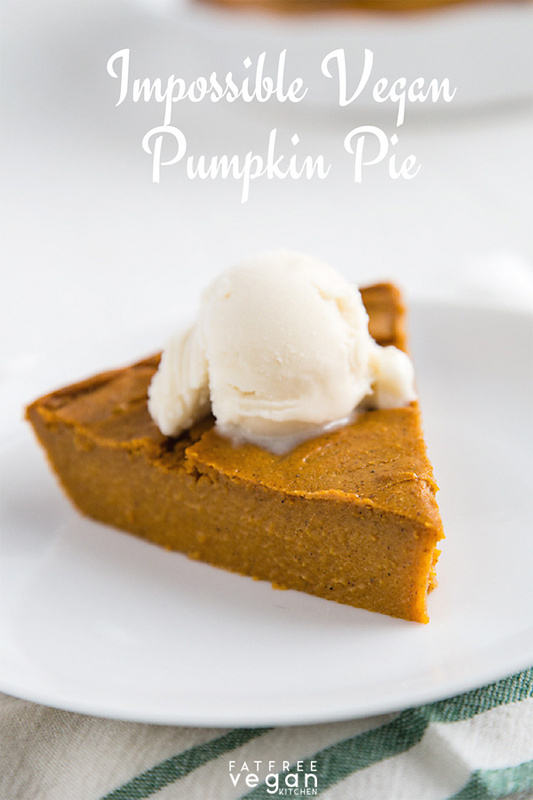 However, it is still a quite inexpensive pie, especially when pumpkins are in season. I also use fresh pumpkin, since I am dutch and we do not have canned pumpkin or anything like that here in the Netherlands 😉 This time I just microwaved the pumpkin to get it soft and that worked really well too! Has anyone made this with All-purpose flour? Hi, I made this pie using the oatmeal option as I did not have any rice flour on hand. It was a bit “wet”, but my husband enjoyed it nonetheless. But, with all the other Thanksgiving veggies etc. on hand, we did not eat it all right away, and found the taste changed over the next few days, to its detriment. How long do you recommend for this recipe? Also, can it be made and frozen? I often find that vegan versions of things are great the day of and maybe the next day, but less so after that, so it is helpful to know which kinds of recipes can be made ahead and frozen, made ahead and how many days, or must be made on the day of. What cooking spray do you use to keep this oil/fat-free? Has anyone used white whole wheat flour or only oat flour or ap flour? I have used whole wheat flour and didn’t like it. Haven’t tried oat or ap flour. Didn’t realize I was out of brown rice flour so used spelt flour instead and it came out great. Also used about a tsp of pumpkin pie spice instead of the other spices, cut the sugar by half and added a few packets of stevia. Both my husband and I loved the texture and flavor! Will definitely make this again.